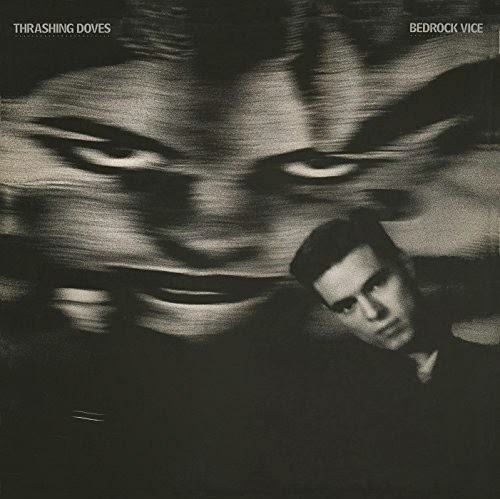 Discussions Magazine Music Blog: SPAZ reviews THRASHING DOVES' Bedrock Vice reissue! SPAZ reviews THRASHING DOVES' Bedrock Vice reissue! Thrashing Doves were never going to have it easy after an initial burst of interest and hype found them in the middle of a major label bidding war even before they had a chance to record demos. This early excitement raised expectations above and beyond a reasonable level, so they already had the odds against them even before they stepped foot in the studio. The fact that 1987’s Bedrock Vice turned out so well is testament to their talents. Comparisons are unfair, but Thrashing Doves would not have been totally out of place on a triple bill sandwiched between The Blow Monkeys and ‘80s-era David Bowie – they were most certainly a Pop band but had a quirky edge to them that separated them from the formulaic Pop pack. While the then-modern production may date the album a bit, the songs ultimately shine through. At their core, Thrashing Doves were closer to artier bands like The Red Guitars than they were to Johnny Hates Jazz or whoever was being polished and prepped in the studio at the time. Strip down the production and Thrashing Doves would have been a lot more jangly – and thankfully their guitar edge does ultimately shine through on Bedrock Vice. Don’t get me wrong: I think that every aspect of the album is wonderful, from the songs to the production. There is so much heart and wonder here but my angle is this – I believe that there was a disconnect between what the Thrashing Doves were and what the label expected from them. Songs like “Beautiful Imbalance,” “Biba’s Basement,” “Tingerbox Man,” and “Matchstick Flotilla” are great songs no matter how you dress them. The production did work in their favor on many occasions, especially on the funky “Jesus On The Payroll”, which has become one of their most well-known tracks. However, the guitar aspect of the band’s sound may have been toned down on the album’s final mix in favor of the more commercial keyboard-based elements of the recordings. Truth be told, Bedrock Vice, regardless of its ‘80s production qualities, is actually as fresh and exciting today is it was nearly 30 years ago. The bonus tracks on this Cherry Red reissue include a few later mixes of ‘Jesus…”, a live Rolling Stones cover and some great b-sides that are less-produced than the album but possibly showcase the band’s originally intended blend of guitar and keyboards. In the end, they DID live up to the hype!